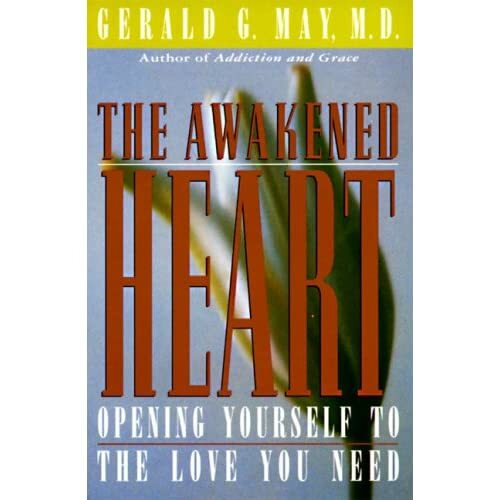 As the title of this post states, I'm reading The Awakened Heart, by Dr. Gerald May. I'm almost done w/ the book and I've really enjoyed it. In it, Dr. May talks about love, practicing being present, and much more. "While washing the dishes, you might be thinking about the tea afterwards, and so try to get them out of the way as quickly as possible in order to sit and drink tea. But that means that you are incapable of living during the time you are washing the dishes" (spoken by Thich Nhat Hanh). Wow. Incapable of living? But it's so true. If I am not consciously present when I'm doing anything, I'm not really there, am I? Nope. I'm just waiting for the next thing. But I don't want to live (or not live, rather) like that. I want to be present in whatever I'm doing. I want to be able to focus on one thing and do it well rather than just trying to finish it quickly (heck, I can't even just sit and watch TV. I have to be doing something else while I watch.). So, I'm going to make an effort to slow down and be present in whatever I'm doing today. Do you ever notice that you are not present in moments? How do you combat it?